I designed these origami peacocks for the National Trust at Osterley House – they will be on the back of the garden trail for visitors to make at home. Thanks to Freya for the colouring in. 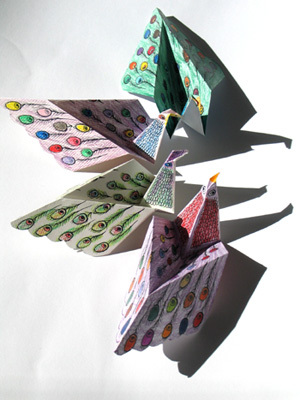 This entry was posted in birds, Family guides and trails, General news, Illustration, New ideas and tagged origami on May 19, 2008 by Jane Porter.